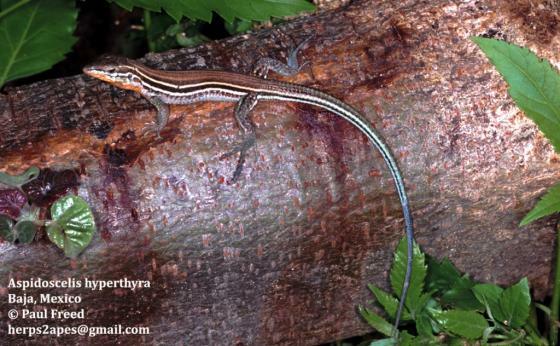 Can you confirm these amateur observations of Aspidoscelis hyperythrus? beldingi: SW California southward on Pacific slopes (not Gulf) to Cedros Island. Type locality: “Cerros” Island, Baja California. hyperythrus: Southern third of the peninsula of Baja California and adjacent islands on both the Gulf and Pacific sides. Type locality: Cape San Lucas, Baja California. schmidti: The central fifth of the peninsula of Baja California and adjacent islands. Type locality: San Marcos Island, Gulf of California, Baja California. Types Lectotype: USNM 5299; USNM 5299A was described by Burt (1931:226) and was formally selected as lectotype by Maslin and Secoy (1986:20). Comment Subspecies, synonymy and distribution after SMITH & TAYLOR 1950 and more subspecies after LINER 1994. GRISMER (1999) elevated a number of species to full species status, including espiritensis, franciscensis. All belong to the Aspidoscelis deppii group (fide REEDER et al. 2002). 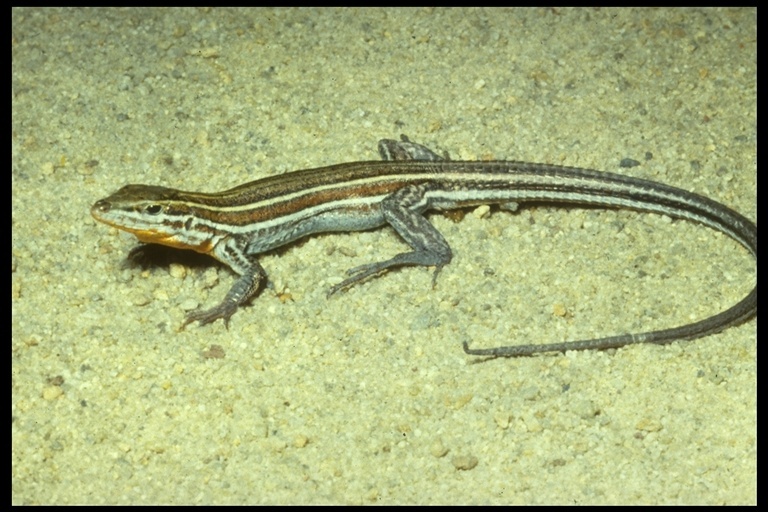 Aspidoscelis hyperythra displays a significant morphological shift between southern and northern populations at the Isthmus of La Paz. However, there are no fixed character states, such as number of pale dorsal stripes, diagnostic of southern and northern populations. The co-occurrence in local populations of variable numbers of individuals with five, six, or seven stripes makes peninsular A. hyperythra an unusual member of the A. deppii species-group, where number of stripes is consistent in local populations (Taylor & Walker 2014).